“You need to get on Social Media.” “You have to build your author platform.” “You have to have a strong online presence if you want to sell any books.” Just about every expert out there has said each of these phrases and more. And chances are you’ve heard all this already — if you want to work from home, you need to get out into the social media marketing world. 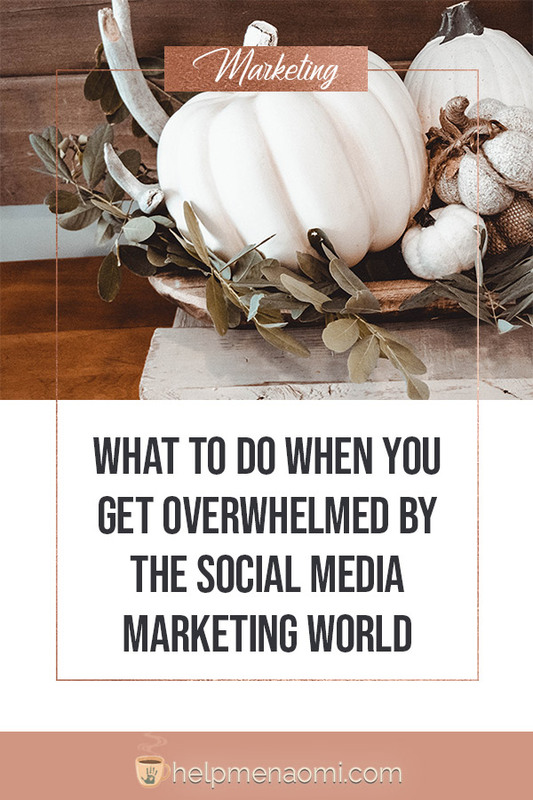 But what happens when the social media marketing world starts to get a little overwhelming? Work at home mothers come across this issue all the time, especially when they’re just starting out and trying to learn how to market their new business. And it doesn’t seem to matter what type of business you have: freelance writer, web developer, author, Pinterest manager, event planner, blogger… the thought of building an online platform for social media marketing can and often does get overwhelming. Thankfully, there are some tips you can follow to help tame the social media beast and keep it from overwhelming you. Start with a few channels. Specifically, develop a strategy for one or two channels, then stick with that strategy until you have it mastered. A lot of people simply share their posts randomly — using a scattershot approach in hopes people will find and come to them. This approach almost never works. At least, not without spending a lot of money promoting those posts. Instead, choose one or two channels that you know you definitely want to include in your platform, and work out a strategy for them. This will give you focus and allow you to assign a purpose to each channel. Additionally, it’s better to master one or two channels and be able to use them efficiently. You’ll gain more followers and recognition this way than you will by throwing random posts across all social media or throwing up duplicate posts all over the place. Once you’ve mastered the first couple channels, you can always add more channels later. This allows you to take your time and set up your strategy right, taking it one channel at a time (and hopefully will seem a lot less huge). If you’re wondering which channels to set up first? I recommend Pinterest and your website or blog. Find some way to plan your content for each channel. I have seen dozens and dozens of sites all recommending different methods and swearing those methods work best. And I guess technically that’s true. Honestly, whatever way is going to help you create, follow, and track your content for each channel, that’s the best method for you. Several of my friends use spreadsheets, notebooks, post-its, or they may even pay for drip campaigns. I use a combination of a digital bullet journal and a pen-and-paper bullet journal. I keep the pen-and-paper journal near my computer so it is right by my side as I am working, and I access my digital bullet journal via my smartphone when I am anywhere but next to my computer. Whatever method you choose, be sure to provide your followers with a mixture of unique content. Your Instagram feed should not be a replica of your Facebook feed. Your Twitter feed should stand out from your Pinterest feed. Yes, it is okay to do some cross-promotion — actually, it’s smart to cross-promote some of your posts. But you want the people who follow you on one channel to follow you on another channel and still gain value. And that means offering something different on each channel that they can’t get by following you on the other channels. Additionally, you want to post things other people will want to read. In other words, don’t just post link after link after link begging for people to buy your stuff, review your stuff, or refer other people to your stuff. People don’t come to social media to be sold to, so don’t use social media to sell to them. I love the power hour. It is hands-down one of my favorite tools. And it’s not even really a tool so much as a technique. Here’s how it works: schedule a regular time to sit down and work out your strategy and graphics for each channel. No, it doesn’t have to actually be an hour — it can be shorter or longer just so long as it provides you with enough time to plan out your content. I still call it a Power Hour because Power 90 Minutes just sounds…weird. And it should be done regularly: every week or every month. I do about 90 minutes once a week for my entire platform, which currently includes my blog, Facebook, Twitter, Instagram, and Pinterest. As I build and add Google+ and LinkedIn to my platform, I will likely increase the time for my power hour to be a power double-hour. Check into automation and scheduling. The point of the power hour is to get the content you want to post on each of your channels planned and written up. That way, all you have to do throughout the week is log in and post everything. Of course, sometimes logging in and posting everything can also take up a lot of your time — especially once you start adding more channels. You can easily take the five minute task of “login and post content” into a half an hour or more if you have to log into several channels. A lot of social media experts will tell you to avoid automation at all costs. And for some things, I absolutely agree. Automatic direct messages, auto-replies and things like that? Not a fan. But I do believe in automating some processes to help make your life a bit easier. Most blogging platforms have some sort of scheduling feature you can use to automatically post your new blog entry. This means you can write up five blog posts on Sunday and schedule them all in a way that paces them out. And it’s free. And wouldn’t it be easier on you to be able to spend a couple of hours on a Sunday to write up all your blog posts and then relax for a few days? For other schedulers and automation, I have a list of tools that I love. In particular, I could not live without my CinchShare, Tailwind, Hootsuite, or IFTTT. Of course, I am talking only about automating certain processes — not your overall presence or engagement. Strategic social media marketing should never, ever be a “set it and forget it” deal. Schedule your posts, but talk to people in real time. If they comment, reply. If they post something you like, retweet or give it a heart. With the hardest parts done for you, you now get to enjoy social media the way it was meant to be enjoyed — by talking to people. With these simple steps, you’ve now taken social media marketing from a daily task that could take anywhere from 30 minutes to three hours of random sharing and hoping, and turned it into a focused strategy that should take anywhere from 5 to 30 minutes per day. And you’ll see much better results.